I recently ran across a statistic that just blew me away – I had never seen it before. According to the US Defense Department, over 70% of young Americans aged 17-24 are ineligible to serve in the military. The main reasons include health problems, obesity, inadequate education and serious criminal records. This has created a recruiting crisis for our military which depends on a constant flow of volunteers every year to meet its requirements in protecting our nation. This is not a crisis we face 5-10-15 years from now – it’s here and now today. That’s what I will focus on today. Before we get to that troubling discussion, let me briefly comment on last Friday’s disappointing employment report for March. US nonfarm payrolls rose only a seasonally-adjusted 103,000 in March – the smallest gain in six months, the Labor Department said Friday. It was a pullback from February’s outsized gain of 326,000 jobs, after revisions, the strongest monthly performance since 2015. The headline unemployment rate remained unchanged at 4.1%, the lowest level in 17 years, for the sixth straight month. Both numbers were disappointing since the pre-report consensus called for 185,000 new jobs and the unemployment rate to fall to 4.0%. While Friday’s jobs report was a disappointment, the labor market remains strong overall. US employers have added to payrolls for 90 straight months, extending the longest continuous jobs expansion on record. Through the first three months of the year, employers added an average of 202,000 workers to payrolls a month, outpacing 2017’s average monthly growth of 182,000. Average hourly earnings for all private-sector workers rose 2.7% from a year earlier in March. The bottom line is that there is now a position open for every unemployed person in the country, and the number of Americans who are working or actively looking for work is higher this year as well. The labor force participation rate climbed to 62.9% in March, up from January’s 62.7%. According to 2017 Pentagon data, 71% of young Americans between ages 17 and 24 are ineligible to serve in the United States military. Put differently, over 24 million of the 34 million people of that age group could not join the armed forces – even if they wanted to. This is an alarming situation which threatens the country’s fundamental national security. If only 29% of the nation’s young adults are even qualified to serve, and these negative trends continue, it is inevitable that the US military will suffer from a lack of manpower. The military depends on a constant flow of volunteers every year to meet its requirements, and as the number of eligible Americans declines, it will be increasingly difficult to meet those needs. This is not a distant problem to address decades from now, it’s here today. The US military is already having a hard time attracting enough qualified volunteers. Of the four services, the Army has the greatest annual need. The Army anticipates problems with meeting its 2018 goal to enlist 80,000 qualified volunteers, even with increased bonuses and incentives. The question, of course, is why so many young people aged 17-24, the most likely group to join the military, are ineligible to serve? The reasons may surprise you, as they did me. I should note that the category above labeled “Physical Fitness” mainly refers to obesity. According to the US Centers for Disease Control, 31% of young people 17-24 are overweight or obese, even higher than the 27% figure in the chart above. In 2009, a group of retired US generals and admirals formed a non-profit group “Mission: Readiness” to draw attention to this growing problem. In their initial report “Ready, Willing, and Unable to Serve,” they warned that the main causes of this situation are inadequate education, criminality, obesity and health issues. 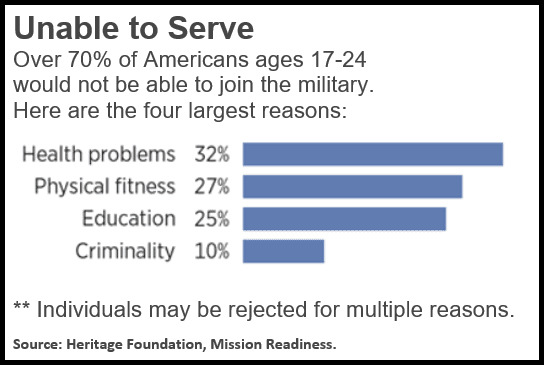 Unchecked, the combined effect of these four conditions will continue to decrease the number of young adults eligible to serve in the United States military. As noted above, to join the armed forces the military across all branches requires that an individual have a high school diploma or a General Equivalency Diploma (GED). This requirement increases the chance that recruits possess a minimum level of education, a basic understanding of written and cognitive skills and hopefully enough determination to have a chance at succeeding in the military should they decide to join. The National Center for Education Statistics reported that in the 2014–2015 school year, the graduation rate for public high school students rose to a record high 83%. While that is welcome news, the percentage of males dropping out of high school is higher than the percentage of females and has been consistently since 1980. These males cannot enlist in the military unless they go on to get a GED. Unfortunately, those with a GED rarely pass the Armed Forces Qualification Test which measures recruits’ math and reading skills. It is staggering to me that only 29% of 17-24 year-old American young people can qualify to serve in our military. Out of apprx. 34 million Americans in that age group, only roughly 10 million have any chance at meeting the requirements. Realistically, only about 1 million are serious candidates. No wonder the armed services are experiencing a recruiting crisis. The crisis is here and now, not 5-10-15 years down the road. And it will only get worse. What surprises me most is that so few Americans know about this. That is why I wanted to bring it to your attention today. I wish I had the solutions, but I do not. This needs to be a serious national debate starting now. In the meantime, let’s hope and pray that there is not another war to be dealt with which would require a much larger military. More and more investors understand the importance of diversifying their portfolios with assets like real estate that are not highly correlated with the stock markets and have the potential to produce income while those assets grow in value. The problem is that most people are not experts in real estate. Tomorrow (April 11th) at 3:00 PM Eastern Time, we will host a live webinar featuring Allan Swaringen, President and CEO of JLL Income Property Trust. Allan has over 25 years of experience in the real estate industry, and you’ll be able to ask Allan your questions at the end of the presentation. Register today for our webinar. You don’t want to miss this opportunity. I highly recommend you join us for our webinar tomorrow at 3:00 PM Eastern Time. Even if you are unable to watch the webinar live, be sure to sign up. We’ll send you a recorded version of the webinar that you can watch at your convenience. You can also call Phil Denney or Spencer Wright at 800-348-3601 to learn more about JLL Income Property Trust. They’ll be happy to answer any questions you have.